Aim: To determine the efficiency of erbium: Yttrium aluminum garnet (Er:YAG) laser with Environmental Scanning Electron Microscope (ESEM) and shear bond strength analysis as a method of recycling stainless steel orthodontic brackets and compare with other methods of recycling. 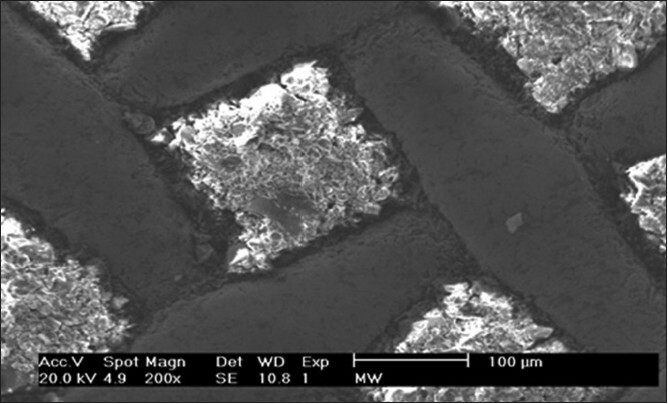 Results: Er: YAG laser group was found to be having the greatest bond strength among the recycled brackets (8.33±2.51 followed by the sandblasting at 6.12±1.12 MPa, thermal and electropolishing at 4.44±0.95 MPa, and lastly the adhesive grinding method at 3.08±1.07 MPa. The shear bond strength of Er: YAG laser group was found to be having no statistically significant difference with that of the control group (P>0.05 and had statistical signifance with sandblasting, thermal and electropolishing and adhesive grinding groups at P>0.001. ESEM analysis showed complete removal of adhesive from the brackets recycled with Er: YAG laser which mimicked that of the control group. Conclusion: Er: YAG laser (2940 nm) was found to be the most efficient method for recycling, followed by the sandblasting, thermal, and the tungsten carbide methods, which had the least shear bond strength value and is not fit for clinical usage. There are many options available for recycling orthodontic brackets. Some of the in-house methods such as thermal (direct flaming only  or Buchman method  ) or mechanical methods (sandblasting, ,,,,,,, green stone, ,, and tungsten carbide bur  ) offer a more realistic, simple, and cost-effective alternative. This study aimed at evaluating the effectiveness of Er: YAG laser along with other methods of in-house recycling such as sandblasting, thermal and electropolishing and adhesive grinding) for reconditioning stainless steel brackets. Ethical clearance was taken before the study was carried out on 100 non-carious premolar teeth, extracted as a part of orthodontic treatment from patients in the age group between 12 and 20 years. The teeth were used within 1 month of extraction and those with any pathology were discarded. Extracted teeth were then cleansed, and after careful debridement, the teeth were stored in saline at room temperature. These 100 teeth were then mounted on acrylic blocks with only their crowns exposed [Figure 1]. The acrylic blocks were color-coded and divided into five groups with 20 teeth in each group. They were then bonded with premolar metal brackets (0.022 slot, Gemini series; 3M Unitek, Monrovia, CA, USA) using Transbond XT light cure composite (3M Unitek, Monrovia, CA, USA). The bonding procedure was performed as per the manufacturer's instructions. The teeth were then immersed in artificial saliva for 24 h prior to testing, so that the pH of the oral environment could be simulated. Group I, control group (20 teeth). Group II, comprising 20 teeth, which were to be recycled by sandblasting method. Group III, comprising 20 teeth, which were to be recycled by thermal method. Group IV, comprising 20 teeth, which were to be recycled by the adhesive grinding method. Group V, comprising 20 teeth, which were to be recycled by Er: YAG laser. 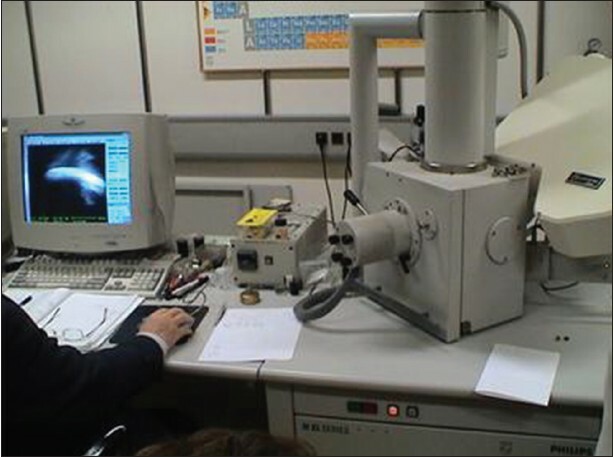 Group I samples were tested on the Lloyd universal testing machine (model LR 100, AMETEK Measurement and Calibration Technologies, West Sussex, UK) [Figure 2] for their shear bond strength (SBS). The cross-head speed was set at 1 mm/min. Load required for debonding each bracket in megapascals (MPa) was recorded and the SBS value was obtained. 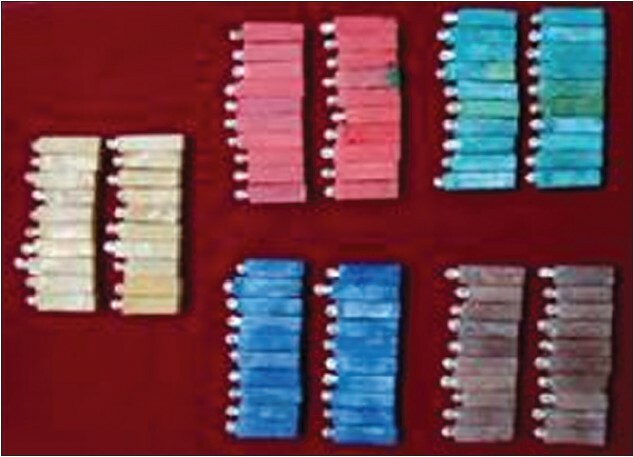 Eighty brackets in groups II, III, IV, and V were then debonded using debonding pliers,  and after debonding each bracket, the corresponding acrylic block was placed back in a separate pouch and numbered. The bracket that was distorted during debonding was discarded and new samples were prepared (altogether 5 new samples were prepared. These 80 teeth were then recycled using the method in their respective group. The sandblasting recycling (MicroEtcher CD, Danville Materials, California, USAmethod consisted of subjecting the bracket bases to aluminum oxide particles of size 50 μm after they were debonded using debonding pliers. 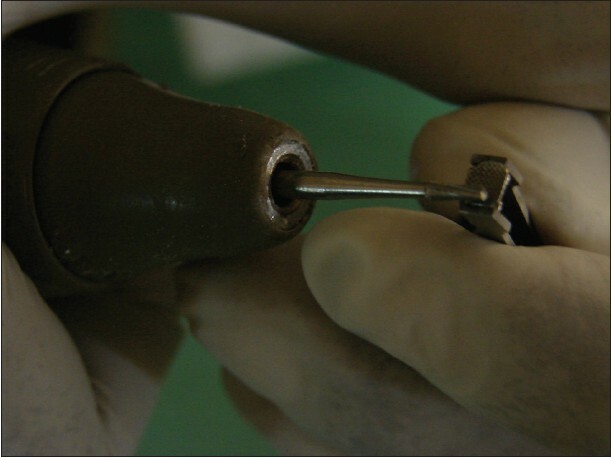 The distance between the sandblasting handpiece and the bracket base was approximately 5 mm [Figure 3]. Each bracket was sandblasted within the range of 20-40 seconds under a pressure of 5 bars until the bonding resin was no longer visible to the naked eye and the bracket base appeared frosted. After sandblasting, the brackets were cleaned with acetone and dried with compressed air. 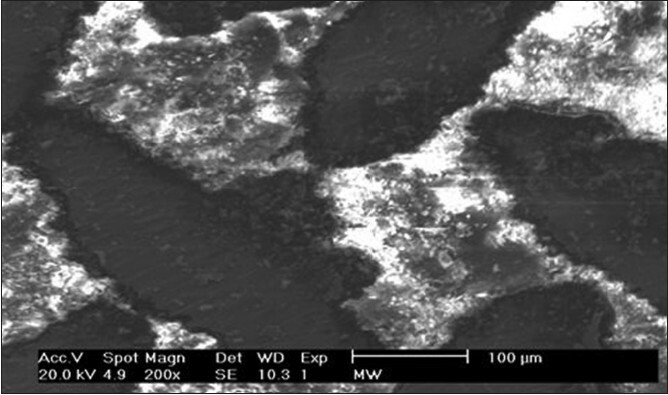 Group III samples were recycled by thermal method, using a micro torch (Jaypee, Kozhikode, India) to burn off the old bonding material [Figure 4], then removing the remaining inorganic filler by scraping the bracket base with a probe - preliminary polishing and electropolishing the attachment - final polishing [Figure 5] (Jaypee, Kozhikode, India). 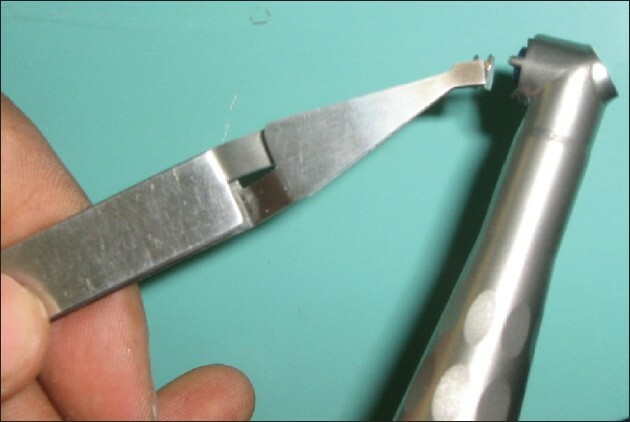 Teeth belonging to group V were recycled by removing adhesive from the bracket using Er: YAG laser (Fidilis + 3, Fotona, Ljubljana, Slovenia, EU) [Figure 7]. Laser of 250 mJ energy at 12 Hz with an average power of 3 W was applied to the bracket for 5 s. The Er: YAG laser has a wavelength of 2940 nm. The adhesive was removed by holding the bracket with a bracket-holding tweezer away from the body and lasing the base of the bracket from top to bottom [Figure 8]. Protective eyewear provided by the manufacturer was used for the whole procedure. ESEM is an innovation in scanning microscopes specifically designed to study wet, oil-bearing, or insulating materials. 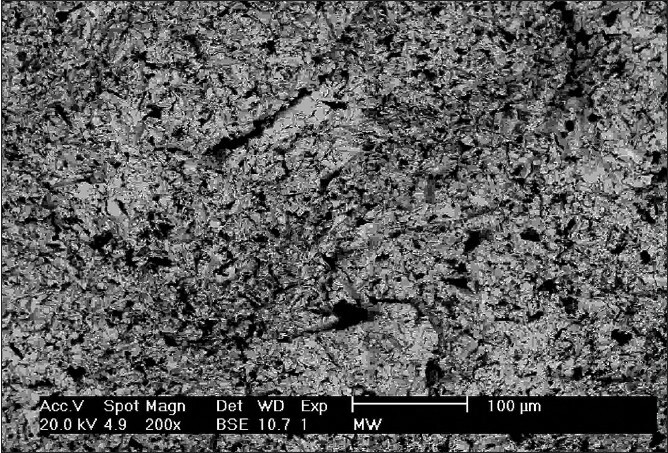 The major advantage of ESEM over normal scanning electron microscopes is that it is not necessary to make non-conductive samples conductive, and thus, their original characteristics can be preserved for further testing or manipulation. Thus, non-conductive samples such as rocks or biological tissue samples can be looked at without the need for adding a conductive coating and the electron signal produces more than one ion per electron, so the signal is amplified without extra electronics that can add noise to the image. The 80 brackets belonging to the groups II, III, IV, and V were rebonded to the same re-prepared tooth to which they were bonded earlier in the similar fashion. 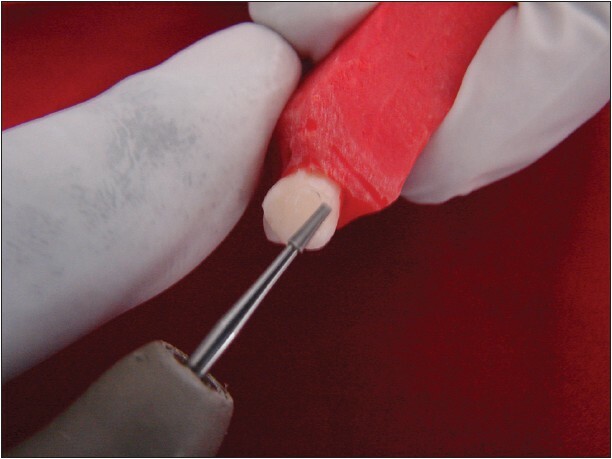 The teeth were prepared by removing the residual composite resin using a tungsten carbide bur (DENTSPLY Limited, Surrey, UK) operated with a straight slow-speed handpiece  (KAVO Electrotech Nisches Werk Gmbh, K9, Germany) [Figure 10]. They were then immersed again for 24 h in artificial saliva prior to testing. 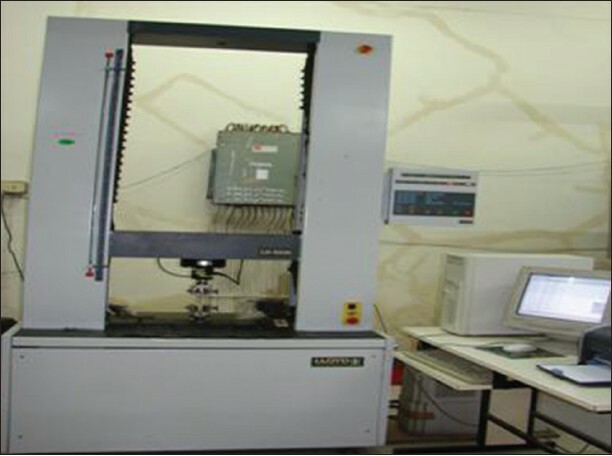 Lloyd universal testing machine (model LR 100, AMETEK Measurement and Calibration Technologies, West Sussex, UK) [Figure 2] was used for SBS testing at a cross-sectional speed of 1 mm/min. The load at the bracket failure was recorded by a computer connected to the Lloyd machine. The SBS values were calculated in megapascals (MPa). The differences between the Shear bond strength data were evaluated by one - way analysis of variance (ANOVA) and post hoc Duncan test using Tukey HSD method. The significance was determined at a probability value of P>0.05 for both the tests. The statistical software Statistical Package for Social Science (SPSS) for windows (version 15) was used for the analysis of the data and microsoft word and excel was used to generate tables. A comparison between the SBS values after the teeth were recycled by four different methods and that of the control group is shown in [Table 1]. Using analysis of variance (ANOVA), there was statistical significance among the groups at P>0.001. The results indicated that the maximum recycled SBS value was seen in the laser method (group V) at 8.33±2.51 MPa, followed by the sandblasting (group II) at 6.12±1.12 MPa, thermal and electropolishing (group III) at 4.44±0.95 MPa, and lastly the adhesive grinding method (group IV) at 3.08±1.07 MPa. 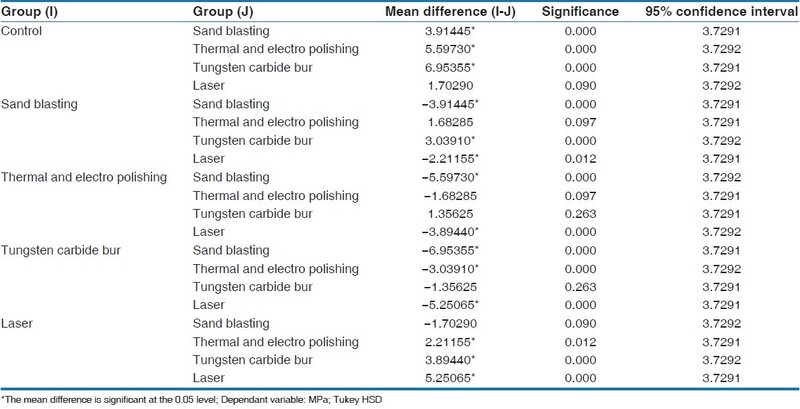 In [Table 2], it is seen that post-hoc tests and multiple comparison using the Tukey's honestly significant difference (HSD) method showed statistical significance between control (group I) and sandblasting, thermal, and tungsten carbide groups at P>0.001, but no significance between control and laser groups at P>0.05. The mean SBS value of the sandblasting group (group II) was significantly different compared with the control group, tungsten carbide bur, and laser groups (P<0.001), but this was not significant compared with the thermal group. Thermal and electropolishing group (group III) showed significantly different mean SBS value compared with control and laser groups (P<0.001), but not with sandblasting group and tungsten carbide group. Tungsten carbide bur group (group IV) demonstrated significant difference with control, sandblasting, and laser groups at P>0.001, but this was not significant compared with thermal group. Lastly, the mean SBS value of the laser group (group V) showed statistically significant difference with sandblasting, thermal, and tungsten carbide groups (P<0.001), but no significance difference was seen with the control group. Complete removal of the adhesive from the bracket base was not seen. The mesh and the inter-mesh cavities were filled with the adhesive even though no visible adhesive was remaining on the bracket, with the remnant adhesive found in curvatures, and only the overhanging adhesive was seen to be removed. removal of the adhesive from the bracket base was not seen. Adhesive remnant was found remaining within the meshwork. The meshwork was also seen to be roughened. Incomplete removal of the adhesive was seen in this group. The mesh network and the adhesive were found scrapped to the same level and the adhesive was removed to that level only. Flattening and loss of meshwork was seen. Adhesive removal was found to be almost complete with this group. The bracket base was seen to closely resemble that of the control group [Figure 15]. The adhesive remnant on the bracket base was negligible. The meshwork was clearly visible, but a slight pickling of the metal was seen. The sandblasting method has the second highest recycled SBS. The increase in SBS values can be attributed to the micro-roughness created by the alumina particles, which therefore creates an increased bonding surface area that is essential for retention. The mean recycled values of the thermal and electropolishing method were much below the normal range and require long exposure to heat. 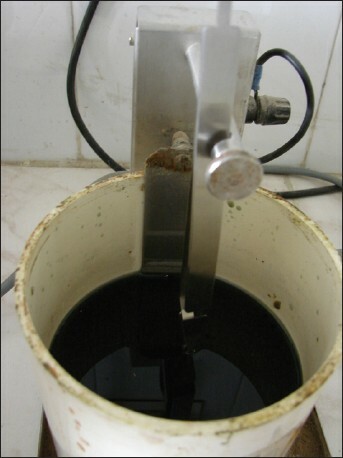 Complete pyrolysis of the resin occurs only at temperatures around 770°C, and during this phase of pyrolysis of resins, it forms acids which are a possible source of inter-granular attack. According to Buchman,  heat influences stainless steel at temperatures of 400-900°C, which would definitely lead to sensitization of the metal. 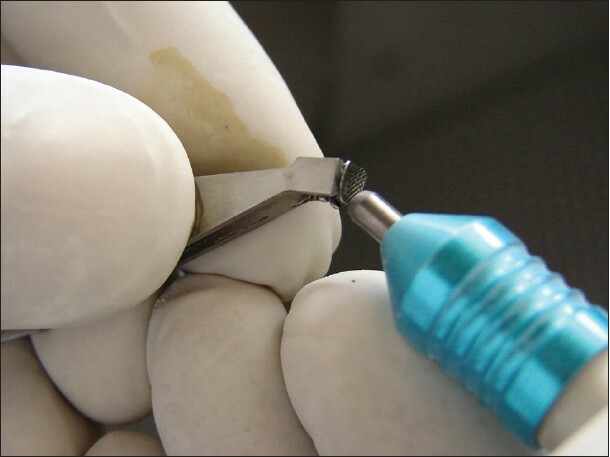 The adhesive grinding method using tungsten carbide bur recorded the least SBS well below the accepted limit and not fit for clinical usage. The grinding of the base using a tungsten carbide bur appears quick, simple, and easy to perform, but the grinding leaves behind a smooth surface with much of the mesh being scraped off. This in turn leads to low bond strength values. 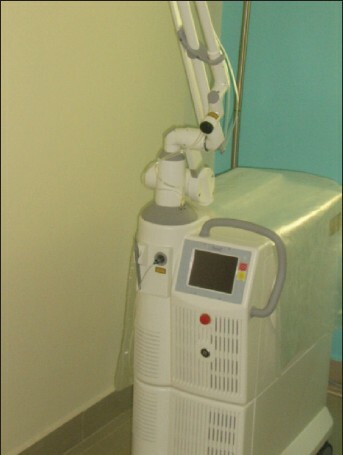 Er:YAG laser was the most efficient method for recycling. The increased shear bond values could be due to the lower penetration energy of the laser and the selective absorption toward composites. ESEM evaluation showed adhesive removal to be almost complete with this group and the bracket base was seen to closely resemble that of the control group. Sandblasting method is the second most effective method of recycling, owing to the increased surface area, which creates better bonding. 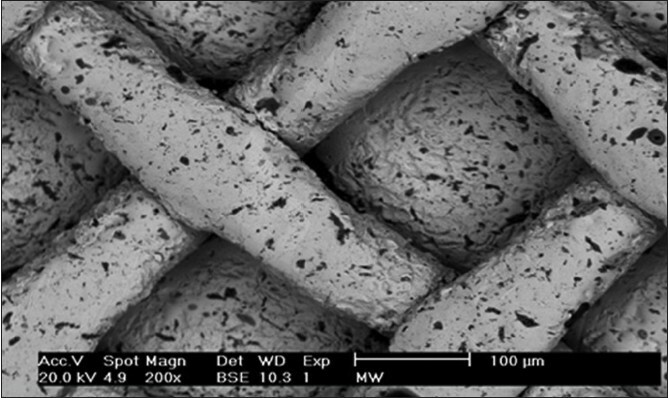 The adhesive grinding method is not a suitable method of recycling as the SBS value was much below the prescribed value for clinical usage due to incomplete removal of the adhesive and flattening and loss of meshwork as seen in ESEM. The mean bond strength following the thermal method was low, and its use also demands justification from the disadvantages it carries as shown by the various authors in their respective studies. 1. Buoncore MG. A simple method of increasing the adhesion acrylic filling materials to enamel surfaces. J Dent Res 1955;34:849-53. 2. Bishara SE, Laffoon JF, VonWald L, Warren JJ. The effect of repeated bonding on the shear bond strength of different orthodontic adhesives. Am J Orthod Dentofacial Orthop 2002;121:521-5. 3. Basudan AM, Al-Emran SE. The effects of in-office reconditioning on the morphology of slots and bases of stainless steel brackets and on the shear/peel bond strength. J Orthod 2001;28:231-6. 4. Buchman DJ. Effects of recycling on metallic direct-bond orthodontic brackets. Am J Orthod Dentofacial Orthop 1980;77:654-68. 5. Quick AN, Harris AM, Joseph VP. Office reconditioning of stainless steel orthodontic attachments. Eur J Orthod 2005;27:231-6. 6. Canay S, Kocadereli I, Ak"ca E. The effect of enamel air abrasion on the retention of bonded metallic orthodontic brackets. Am J Orthod Dentofacial Orthop 2000;117:15-9. 7. Chung CH, Friedman SD, Mante FK. Shear bond strength of rebonded mechanically retentive ceramic brackets. Am J Orthod Dentofacial Orthop 2002;122:282-7. 8. Cua G, Marshall R, Kudlick E, Eichmiller F. Thesis Abstracts A comparison of bond strength of new and used brackets. Am J Orthod Dentofacial Orthop 1997;112:A1. 9. Tanase S, Takada Y, Tamura Y. Shear bond strength of Nd: YAG laser-irradiated versus acid-etched human enamel. International Congress Series 2003;1248:171-3. 10. Kim SS, Park WK, Son WS, Ahn HS, Ro JH, Kim YD. Enamel surface evaluation after removal of orthodontic composite remnants by intra oral sand blasting: A 3-dimensional surface profilometry study. Am J Orthod Dentofacial Orthop 2007;132:71-6. 11. 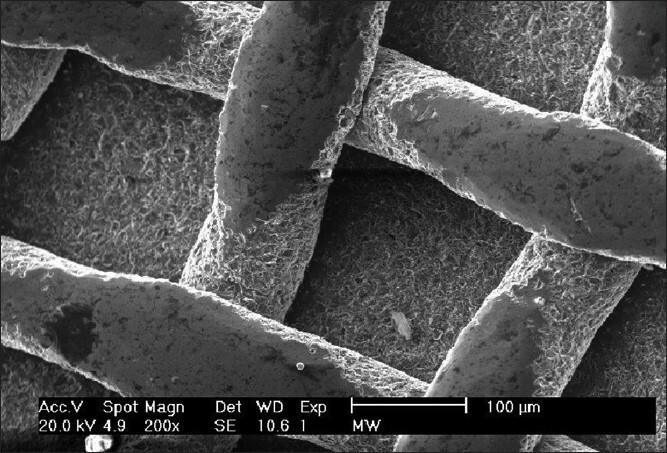 Uºümez S, Orhan M, Uºümez A. Laser etching of enamel for direct bonding with an Er, Cr: YSGG hydrokinetic laser system. Am J Orthod Dentofacial Orthop, 2002;122:649-56. 12. Rajagopal R, Padmanabhan S, Gnanamani J. A comparison of shear bond strength and debonding characteristics of conventional, moisture-insensitive, and self-etching primers in vitro. Angle Orthod 2004;74:264-8. 13. Wheeler JJ, Ackerman RJ Jr. Bond strength of thermally recycled metal brackets. Am J Orthod 1983;83:181-6. 14. Eminkahyagil N, Arman A, Cetinsahin A, Karabulut E. Effect of resin-removal methods on enamel and shear bond strength of rebonded brackets. Angle Orthod 2006;76:314-21. 15. Moritz A. Oral Laser Application. Editorial: Taking Up a New Challenge Vol 6, Berlin: Quintessence Publication; 2006. 16. Colluzi DJ. An overview of laser wavelengths used in dentistry. Dent Clin North Am 2000;44:753-65. 17. Dederich DN. Lasers in orthodontics. J Am Dent Assoc 2004;135:696-8. 18. Dederich DN, Bushick RD. Lasers in dentistry. J Am Dent Assoc 2004;135:204-12. 19. Lee BS, Hsieh TT, Lee YL, Lan WH, Hsu YJ, Wen PH, et al. Bond strengths of orthodontic bracket after acid etched, Er: YAG laser-irradiated and combined treatment of enamel surface. Angle Orthod 2003;73:565-70. 20. Basaran G, Ozer T, Berk N, Hamamci O. Etching enamel for orthodontics with an erbium, chromium: Yttrium scandium gallium garnet laser system. Angle Orthod 2007;77:117-23. 21. Sonis AL. Air abrasion of failed bonded metal brackets: A study of shear bond strength and surface characteristics as determined by scanning electron microscopy. Am J Orthod Dentofacial Orthop 1996;110:96-8. 22. Strobl K, Bahns TL, Willham L, Bishara SE, Stwalley WC. Laser aided debonding of orthodontic brackets. Am J Orthod Dentofacial Orthop 1992;101:155-8. 23. Tocchio RM, Williams PT, Mayer FJ, Standing KG. 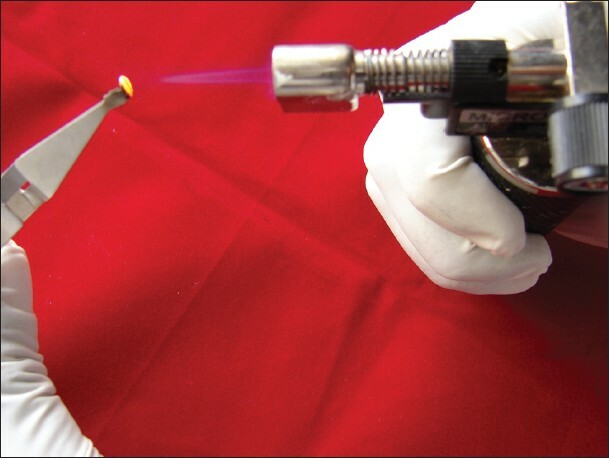 Laser debonding of ceramic orthodontic brackets. Am J Orthod Dentofacial Orthop 1993;103:155-62. 24. von Fraunhofer JA, Allen DJ, Orbell GM. Laser etching of enamel for direct bonding. Angle Orthod 1993;63:73-6. 25. Corpas-Pastor L, Villalba Moreno J, de Dios Lopez-Gonzalez Garrido J, Pedraza Muriel V, Moore K, Elias A. Comparing the tensile strength of brackets adhered to laser-etched enamel vs. acid-etched enamel. J Am Dent Assoc 1997;128:732-7. 26. Elaut J, Wehrbein H. The effects of argon laser curing of a resin adhesive on bracket retention and enamel decalcification: A prospective clinical trial. Eur J Orthod 2004;26:553-60. 27. Hildebrand KS, Raboud DW, Heo G, Nelson AE, Major PW. Argon laser vs conventional visible light-cured orthodontic bracket bonding: An in-vivo and in-vitro study. Am J Orthod Dentofacial Orthop 2007;131:530-6. 28. Lalani N, Foley TF, Voth R, Banting D, Mamandras A. Polymerization with the Argon laser: Curing time and shear bond strength. Angle Orthod 2000;70:28-33. 29. Eslamian L, Borzabadi-Farahani A, Hassanzadeh-Azhiri A, Badiee MR, Fekrazad R. The effect of 810 nm low-level laser therapy on pain caused by orthodontic elastomeric separators. Lasers Med Sci, doi: 10.1007/s10103-012-1258-1. 30. Wright WL, Powers JM. In vitro tensile bond strength of reconditioned brackets. Am J Orthod Dentofacial Orthop 1985;87:247-52. 31. Matasa CG. Pros and cons of the reuse of direct bonded appliances. Am J Orthod Dentofacial Orthop 1989;96:72-6. 32. Vlock RS. In-office bracket reconditioning. J. Clin Orthod 1981;15:635-7. 33. Huang TH, Yen CC, Kao CT. Comparison of ion release from new and recycled orthodontic brackets. Am J Orthod Dentofacial Orthop 2001;120:68-75. 34. Reynolds IR. A review of direct orthodontic bonding. Br J Orthod 1975;2:171-8. 35. Eslamian L, Borzabadi-Farahani A, Mousavi N, Ghasemi A. 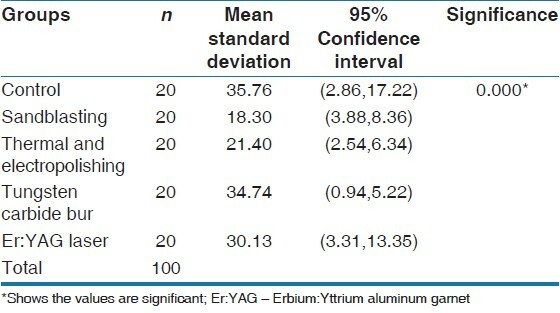 The effects of various surface treatments on the shear bond strengths of stainless steel brackets to artificially-aged composite restorations. Aust Orthod J 2011;27:28-32. 36. Artun J, Bergland S. Clinical trials with crystal growth conditioning as an alternative to acid-etch enamel pretreatment. Am J Orthod 1984;85:333-40. 37. Bishara SE, Trulove TS. Comparisons of different debonding techniques for ceramic brackets: An in vitro study. Part II. Findings and clinical implications. Am J Orthod Dentofacial Orthop 1990;98:263-73. 38. Eslamian L, Borzabadi-Farahani A, Mousavi N, Ghasemi A. A comparative study of shear bond strength between metal and ceramic brackets and artificially aged composite restorations using different surface treatments. Eur J Orthod 2012:34:610-17. 2 Sustainability in Orthodontics: what can we do to save our planet?